Ever since my first trip to the Boundary Waters when I was 16, I’ve been aiming north. I grew up in the hills of Northeast Iowa, and spent my childhood envisioning cornfields as the prairies of Laura Ingalls Wilder. But as we drove up the Gunflint Trail and paddled deep into the Wilderness, the gnarled elegance of evergreens, the austerity of bedrock, and the connectivity of water captured my imagination instead. When choosing a college, I went north to Lake Superior. And when looking for both jobs and adventures, I’ve mainly stayed in the northern tier of states, working in northern California, Maine, Wyoming, and Minnesota. (Southeast Utah is an exception that proves the rule: it is heavily populated by both evergreens and bedrock.) Cable, Wisconsin, where I landed after graduate school in Vermont, is a happy compromise between the Boundary Waters and my family in Iowa. The north has been good to me. Yesterday I went for a spin on my road bike. Today I skate skied around a frozen bog on firm crust. I’ve been a naturalist at the Cable Natural History Museum for seven years. I have a garden, a community, and a great job. But I also have a little bit of that old wanderlust, and a pull to go north. In all my years of travel as a seasonal naturalist, I never made it to Alaska. My parents have been there. Friends have been there. And they all tell me I’d love it. But I can’t imagine spending just a two-week vacation there. Alaska is huge. My parents visited Alaska both pre-kids and as empty-nesters. We had great family vacations, but never to Alaska. In 1976, my dad to this photo of the Mendenhall Glacier near Juneau, Alaska. Photo by Larry Stone. So, after seven years, it’s time for a sabbatical. I’ll be spending the entire summer in Alaska: June through August, with two weeks on each end for driving there and back. My original plan was to get a job as a field tech at one of the ecological research stations up there. I wanted to gain more experience doing science. I am constantly learning and sharing facts that scientists have discovered. I want to have a better idea of how they conduct their research. But all the jobs needed me to start in April or May. Plan B is potentially even more exciting. I’ll be spending the summer traveling throughout Alaska (Where? Everywhere!) as a science journalist. I’ve already convinced a couple scientists that they should let me tag along on their work to learn about what they do, and then write about their research. I want to tell the stories of science. So I will tell them through this Natural Connections column and my blog, which you can find a link to at http://cablemuseum.org/connect/. One adventure will be a road trip to Valdez, to hire a local fishing boat to help us fill a few large jugs with seawater. Back in the lab at the University of Alaska Fairbanks, we’ll run tests to determine how well natural populations of bacteria are doing at breaking down oil from the Exxon Valdez oil spill that occurred in Prince William Sound in 1989. I was only seven years old, but I still remember the television coverage. “Boreal.” It’s one of my favorite words. It means “of the north or northern regions.” I can’t wait to learn more about the boreal forest. I’ve already started reading up. 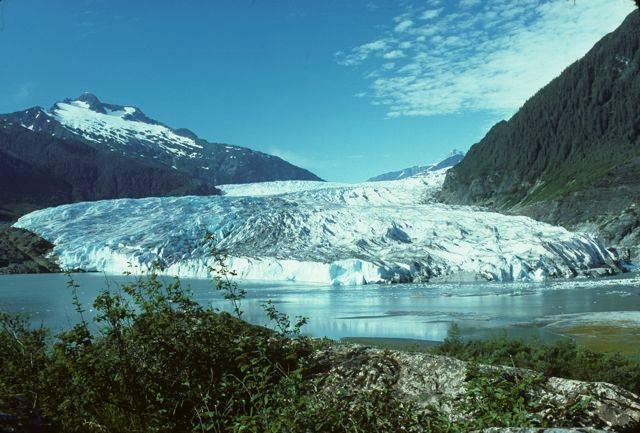 Did you know that much of interior Alaska was not glaciated, and is covered by loess, and that those are two characteristics it shares with Iowa? Did you know that a creature exists called an ice worm that lives near the surface of glaciers? Did you know that black spruce—our wet-footed neighbor in bogs—is fire tolerant in Alaska? By learning more about the ecology of Alaska, I think I’ll understand the ecology of Wisconsin better, too. My tentative launch date for this trip is May 15. I’ll head south to see family before going north again to visit Idaho (another state I’ve never been to,) and catch the car ferry in Bellingham, Washington, for a voyage up the Inside Passage. I’ll be writing about my adventures along the way. I hope you’ll follow along! And yes, I will return. My projected arrival back home is mid-September. Very few of my plans have settled into dates yet, and I’m still looking for more adventures. If you have ideas for scientists to visit, can’t-miss attractions or hikes, or kind people with soft couches, warm showers, and laundry facilities, I’d be happy to hear about them! 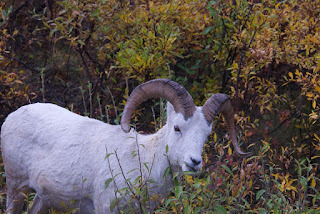 My parents saw this bighorn sheep on their most recent trip to Alaska…without me. Photo by Larry Stone. Trip of a lifetime! If you are not familiar with Dr. Lynn Rogers at the North American Bear Center in Ely (www.bear.org), you may want to contact him. His lifelong research has been with black bears. He is known as the man “who walks with the bears”. I follow his daily blog. That aside, he has often talked about his fellow researchers in Alaska who study the black & brown bears as well as the grizzlies. You may be able to hook up with one of them for some animal side of the research in Alaska too. Dr. Lynn Rogers is now 75 years old and is a good friend of Dr. Jane Goodall. Have a great trip! Can’t wait for the posts to come pouring in!